I make no bones about my love of the color green in decorating. I will fully own up to the fact that I use it often and maybe too much for some people. I don’t care though. I’m not a quitter. Meg from Green with Decor emailed me a couple months back and asked if I wanted to join in on a St. Patrick’s Day blog hop featuring green decor. Ummm….hello….it’s like I was made to do this blog hop. Of course, I said yes, but also told her that since we were moving to the 70’s Landing Pad, I might not have very many “new” green decorating tricks to share, but I could share my favorite green decorating moves. She was cool with that, so here we are and here are my favorite green decorating moves I’ve done. If you’re a fan of decorating with green like me, you can hop around to the other blogs featuring their green decor at the end of this post. This vignette is one of my favorites, mainly because of the vintage cowboy blanket that’s a family heirloom in my book, but also because of how random everything is, yet it worked so perfectly together. 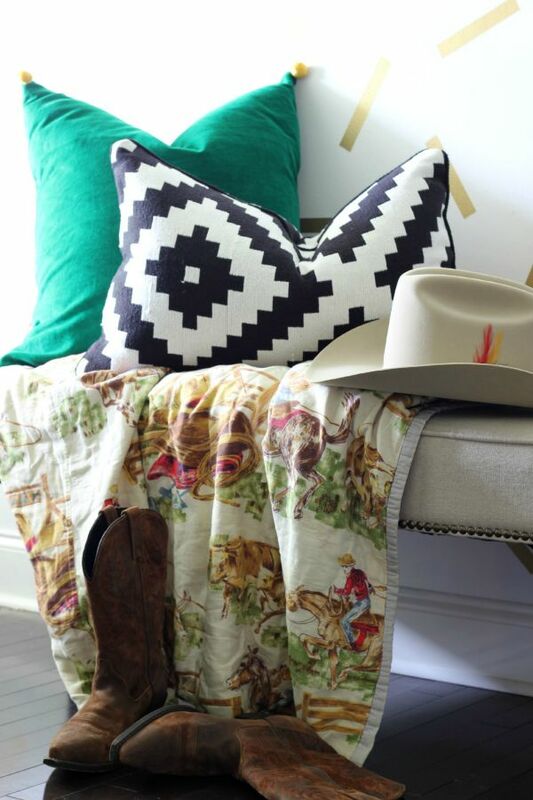 I thought for sure putting a cowboy hat and blanket against a gold confetti wall and throwing in a bold black and white graphic pillow and green velvet pillow would be a mistake. I’m so glad I was wrong though. And then, there’s my barstools. Don’t they just look gorgeous popping off that navy and white kitchen? They were also a simple makeover. I have likened this piece to a mullet – business in the front, party on top (instead of the back). 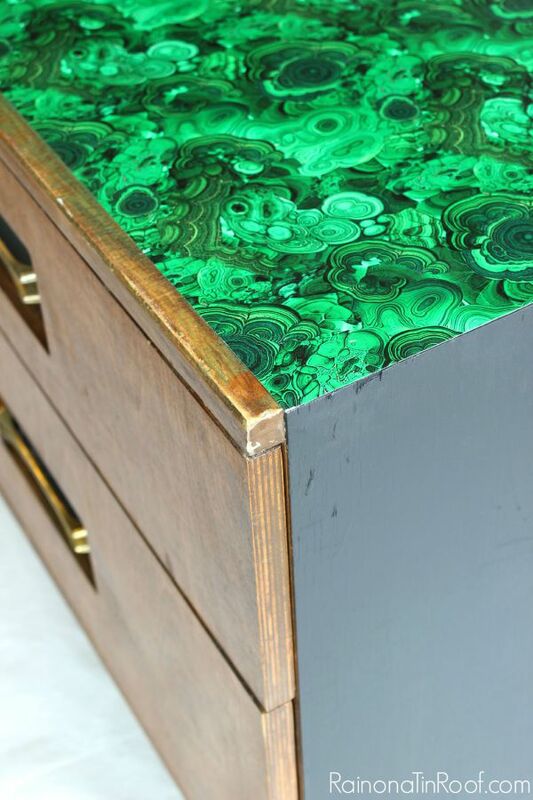 The green malachite on top is actually wrapping paper. 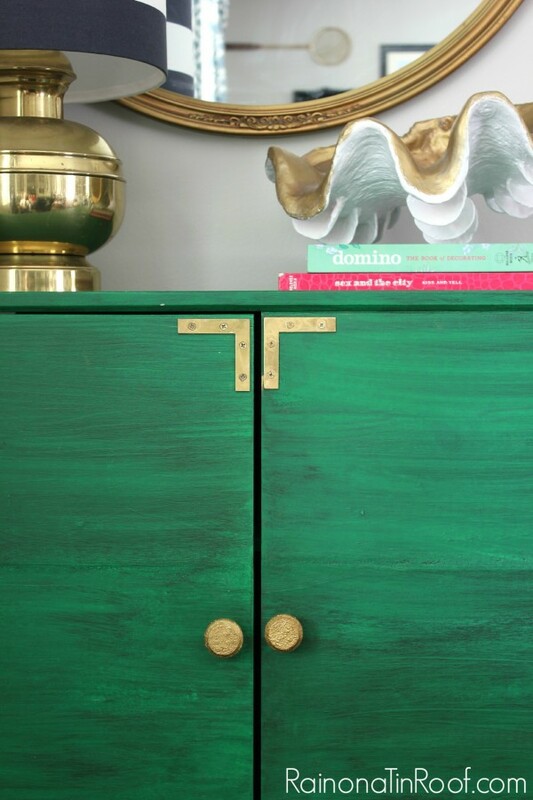 This IKEA Tarva three-drawer dresser got turned into a bar cabinet – with a little help from green paint. Obviously, malachite and I are pretty tight. 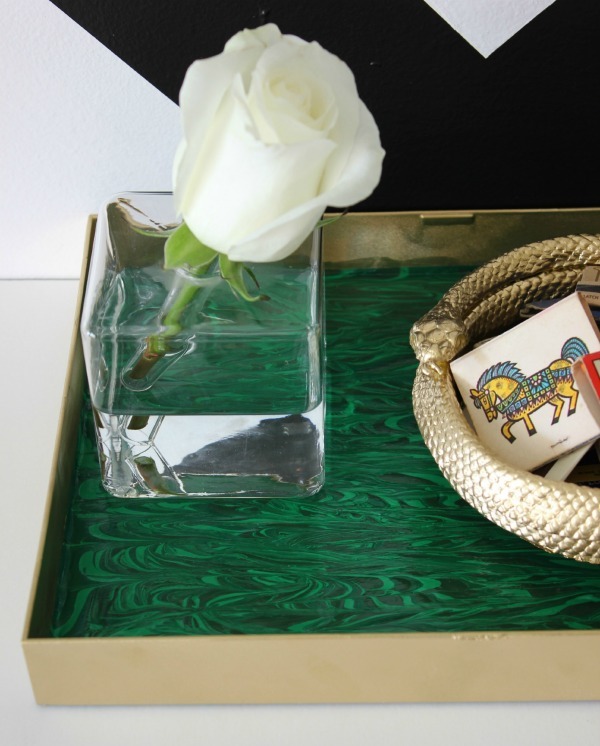 This malachite tray wasn’t made with malachite at all – just paint. And it was so easy. 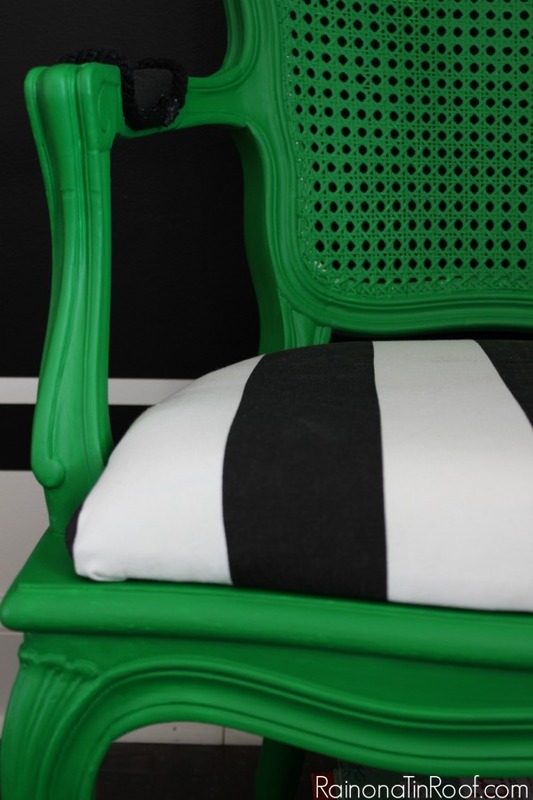 Hands down, probably, so not really hands-down, but you know what I mean, my favorite color combination is green paired with black and white – like in this modern french country chair makeover. 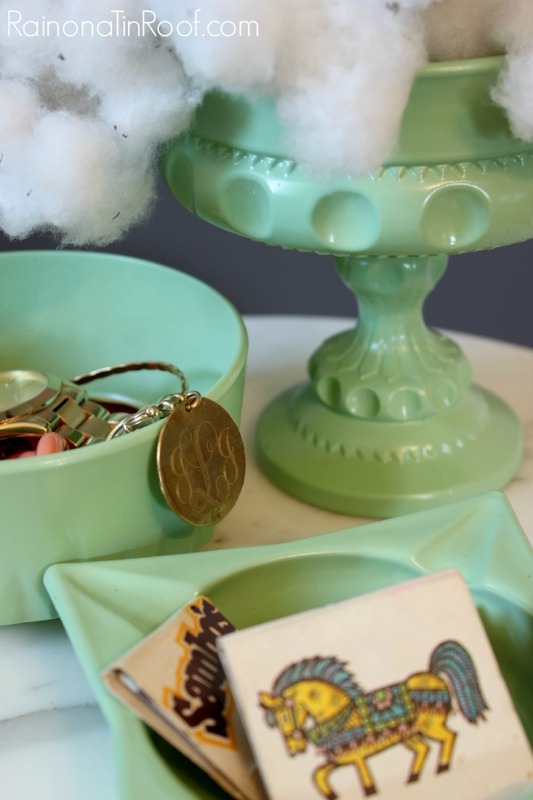 Not my favorite shade of green, but I won’t turn my nose up at it, this DIY jadeite was another easy project. 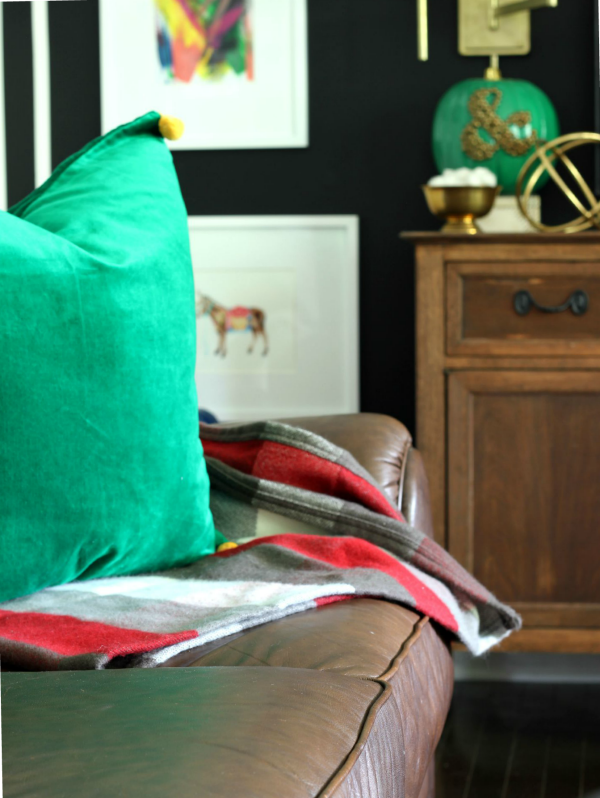 My favorite green velvet pillow also pairs perfectly with a plaid blanket. 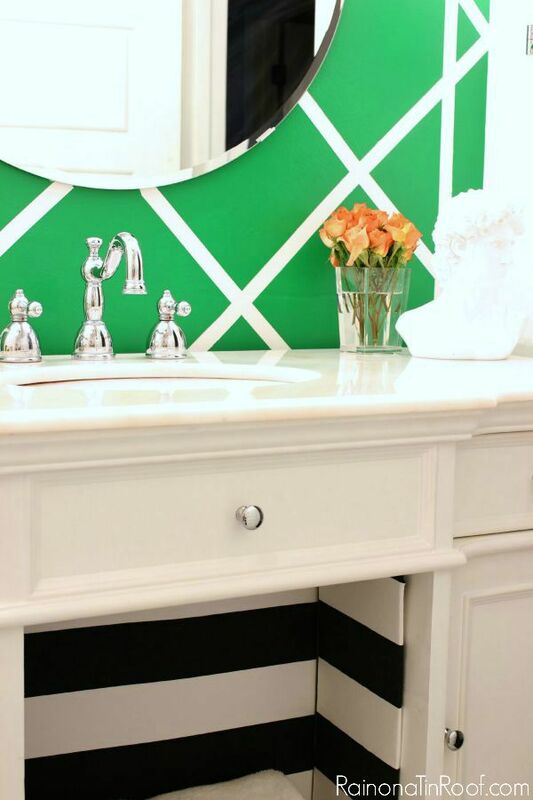 This green and white cane inspired accent wall gave a punch of color and pattern to my previously all-white bathroom. 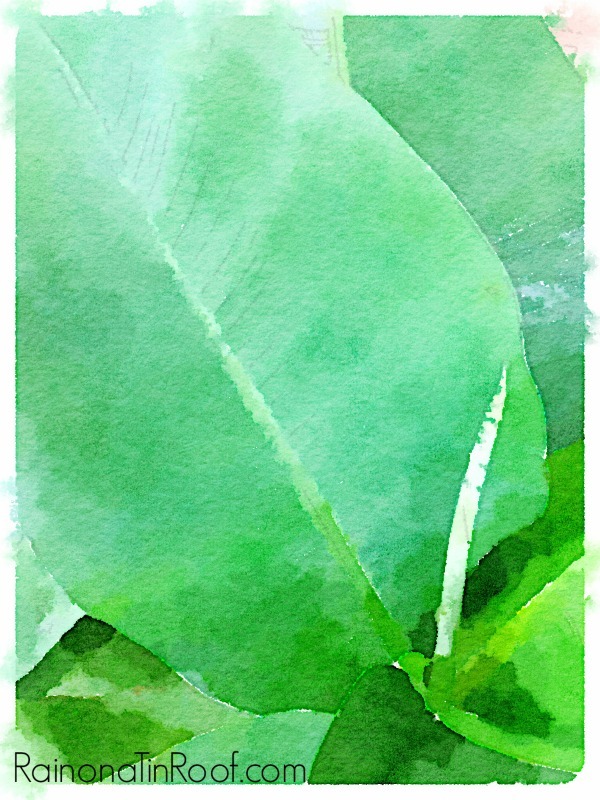 This banana leaf watercolor print helped to tie in the green accent wall in my bathroom. These watercolor prints are actually FREE printables you can find HERE! Obviously, my love for green runs deep! You? I love green one of my favorite colors. One of my favorite paint colors was a Benjamin Moor color chrome green, it is a really dark rich green. I have used it on shutters in kitchens window trim. I haven’t used it in this house so far and they probably don’t have it on their chart anymore but they probably still have the formula and will mix it for me. My reason for not using green in this house is my new husband of eleven years doesn’t like green (I wish I had known that before we married) he likes blue, I can handle navy especially with kelly green thrown in for good measure haha. So this is a boring neutral house I do have pops of color with pillows and throws that I change with seasons and moods, but for me it is still boring. haha! Patty, you cracked me up that “I wish I had known that before we married” comment!!!! hahahaha!!! We’re going to have to bring him to the green side! I love the bar stools against the white and navy kitchen. Will that color scheme be changing? The kitchen at the new house actually will be a different color scheme, Debra! I will be sad to leave this kitchen behind, but I’m excited about designing the new one! I absolutely love green! My favorite color! So happy to see someone else loves it too! Girl, I’m right there with ya! I love it, Jenna! Emerald green has been my favorite color lately. All of your projects are perfect! 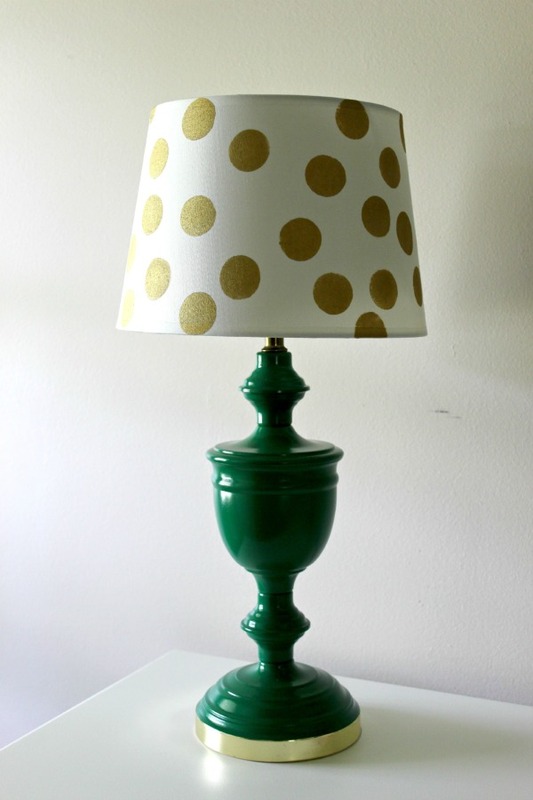 You had me at the green lamp, what a perfect shade of green! That color combo in the kitchen is pretty awesome, too! Thanks, Roxanne! I love that shade of green as well. The lamp was love at first sight! Jenna! You’re in my head! Anyway, back to you being in my head: I’ve been thinking of upholstering the back with 2 1/2″ black and white stripes and the front with bright emerald green velvet. Probably paint the wood (currently a really bad shade of brown) in black appliance paint (for the shine). I want to do something a little different in the oval…a large graphic in green/white/red on a black ground, maybe. First off, I LOVE this color scheme you’ve got going on!!! I think it’s perfect! I think you could go with the large graphic in green/white/red, etc. Just keep in mind when you put green and red together, some people automatically think Christmas. Personally, I love those two colors together no matter what! You could also maybe bring some of the black and white striped fabric from the back in the center piece on the front? Thank you for the encouragement, Jenna! On the oval, think of something like this: one huge red rose with a tiny bit of white in the petals and some emerald green leaves on a black background. I’m not really in love with a rose but I can’t get that idea out of my mind. I tend to use color wheel opposites as accents. The kitchen and dining room are black and white with jadite knobs and pulls, red tools, and both in the gallery wall and on the dining room rug. My office is is warm taupe with Tiffany Box Blue and Hermes Orange accents. The living room will be a Victorian art gallery with (probably) light gray walls and a mass of color everywhere else. Can’t wait to see your process! Girl, I think that will look fabulous!! I don’t think there would be an ounce of “Christmas resemblance” with a rose or something like that since it’s already naturally red and green. I also think it would all fit very well with the rest of your decor! Jenna – your green decor is just beautiful. But, don’t even get us started on your gorgeous kitchen! Love your style. So happy to share the tour with you! Aww, thanks so much, girls!! I just love my kitchen too! I love the bold way you display one of my favorite colors! Especially in your kitchen, with stools! Heck, it’s all gorgeous! Enjoyed your tour today, Jenna! I do love how your green bar stools pop off of the white and navy. Such an amazing color combo! But my favorite part is your green and white accent wall in the bathroom. I think it might have been the first post of yours that I ever read! Good luck with the 70’s Landing Pad! Thanks, Tiffany!! That accent wall is a favorite of mine as well! I’m a color girl too and I love all your touches of green throughout your house! Your green french country chair makeover and your entire kitchen are my favorite. Thanks, Ashley! Those are two of my favorites as well! 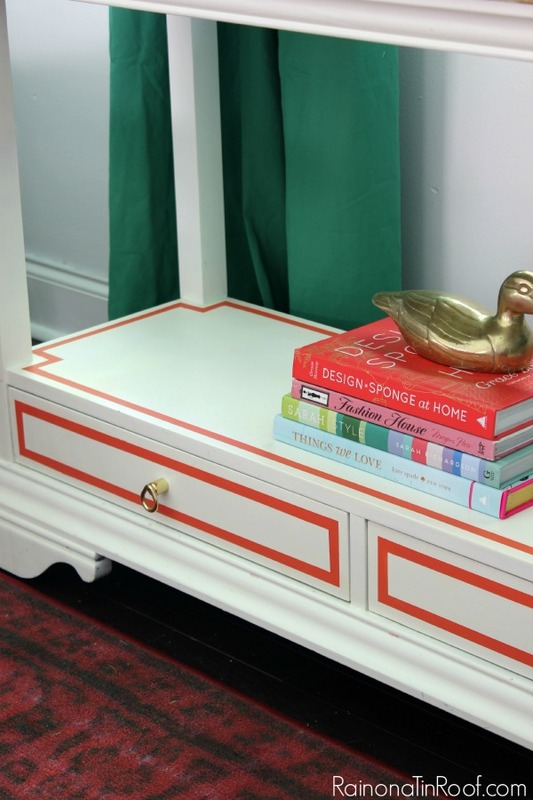 I absolutely love bright, bold colors in a home! Your style is fantastic! Also…can I just say…the gold accents in your kitchen are perfection 🙂 Now I’m so excited to see all that you do with the 70’s Landing Pad. I need to get caught up! Obviously, I love all your green pieces! 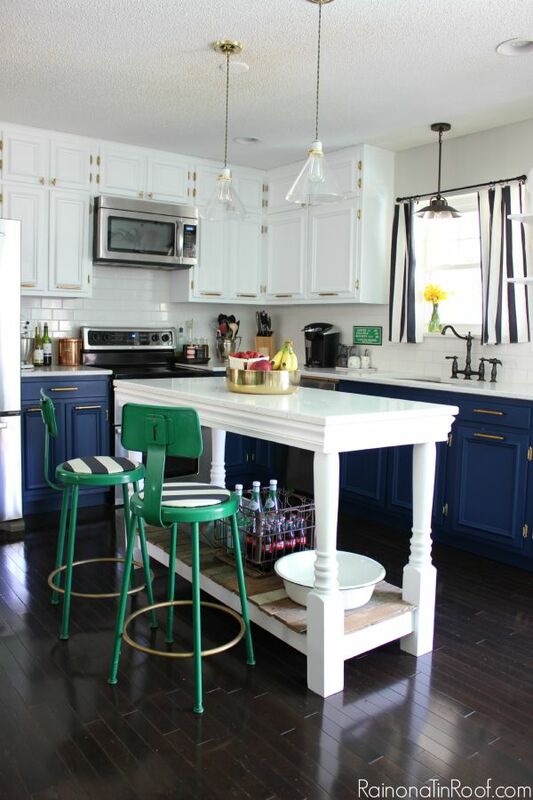 The bar stools are the perfect pop of green in your kitchen! Thanks for joining in on such a fun tour! Thanks for organizing the tour, Meg! Love the green in your style! So pretty!!! I love your vibrant home and how you incorporate color! Green is the best! Thanks, Erin! I feel the same way about green! Awww, thanks so much Kathy! Super cool projects Jenna! You have standout style and your love of the color green is so clear. Love love the jadite but that green chair is absolutely gorgeous. Thanks, Stephanie! That’s one of my favorites as well! This is so beautiful! Thanks for sharing at I’m Lovin’ It Link Party.